Patagonia M10 review, ultralight emergency shell. Updated. Patagonia’s M10 jacket was for many years a very popular choice with ultra-light backpackers. A quality hard-shell with one of the lowest weight on the market. When Patagonia decided to re-release a new version for Spring 2013, we all got exited. Read our impressions after 4 months of testing. Update: Now 3 years after I first reviewed this jacket, my impressions haven’t changed. 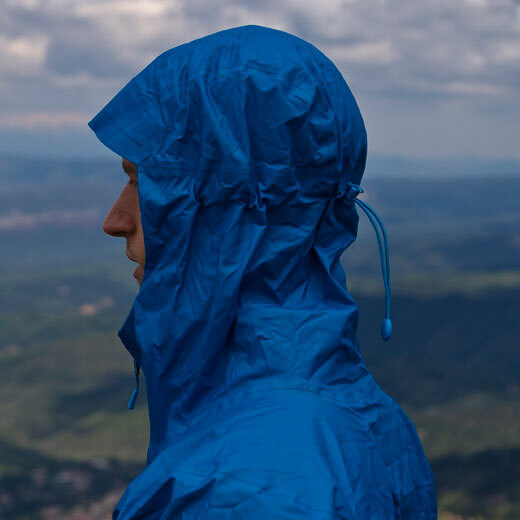 It’s a great rain jacket not only for emergencies but for everything outdoor related. Where I had some doubts on how good a jacket this light would hold on the long run I am know positively impressed. The Patagonia M10 has traveled with me to many places: Morocco, Norway, Cambodia as well as on countless hikes here in Spain. It has a few stains but not a single scratch. If you need wind and rain protection in a lightweight package this is it. This Patagonia M10 review is the result of many days on the field. Spring in Spain brings its share of showers thus occasions to put the M10 to the test have been frequent. I have used it mainly as an emergency rain shell on hikes and climbs. This is what Patagonia is selling it for. I would add that it is also a nice jacket for travelers due to weight and space savings. When unpacking this thing you quickly notice the weight, or lack of it thereof. Only 220g / 7.76oz on my scale in size S. This is the lightest men jacket we have around. No heavy fabric here. Just a very thin and soft 3 layers construction. Minimalistic in its look, the M10 has only one pocket, situated on the chest. Scratched hand-cuffs, drawcord hem and helmet compatible hood complete the list. That’s it. That’s all you really need in truth. I missed the two hand pockets at first but quickly adapted and what I first thought would be a deal breaker for me, was forgotten. When testing a hard-shell the first criteria is of course waterproofness. In modern gear, by known manufacturers, we know what to expect. Two Gore-Tex Active jackets cannot perform very differently from one-another. They use the same WP/B membrane, they will both hold for roughly the same time in bad weather. Here Patagonia are using their proprietary WP/B membrane called H2No. We’ve tested stuff made with H2No before and the consensus is, it’s very waterproof, OK breathable. I would recommend it for slow-paced sports, not for running. Zippers are smooth in operation and highly water-resistant. All seams are welded and taped. 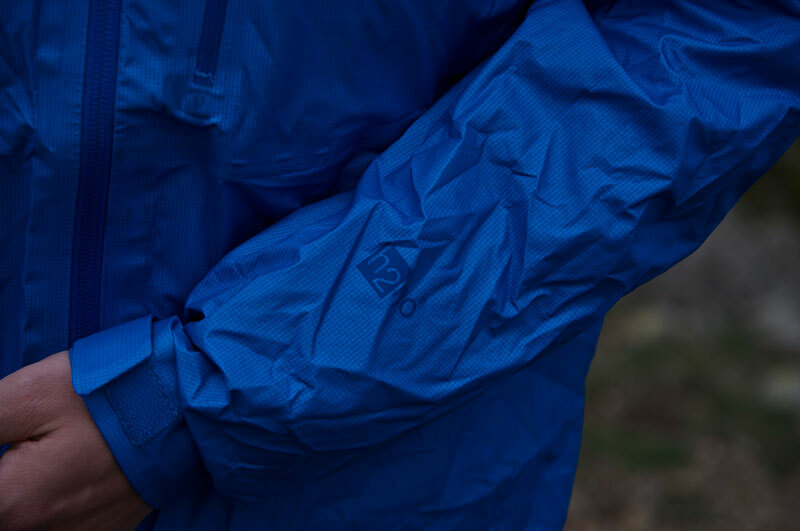 During the Patagonia M10 review I found it to be a rain shield, H2No will keep you dry for hours from the rain and playing with the front zipper to adjust air-flow will help to maintain a good balance on the inside. I am also a big fan of the Deluge durable water-repellent treatment (DWR) Patagonia use on most of their gear. This stuff is damn good. Brand new, water seems to fear the fabric. It curls in a neat sphere or just rolls off. Wind is of course not a problem with the M10. 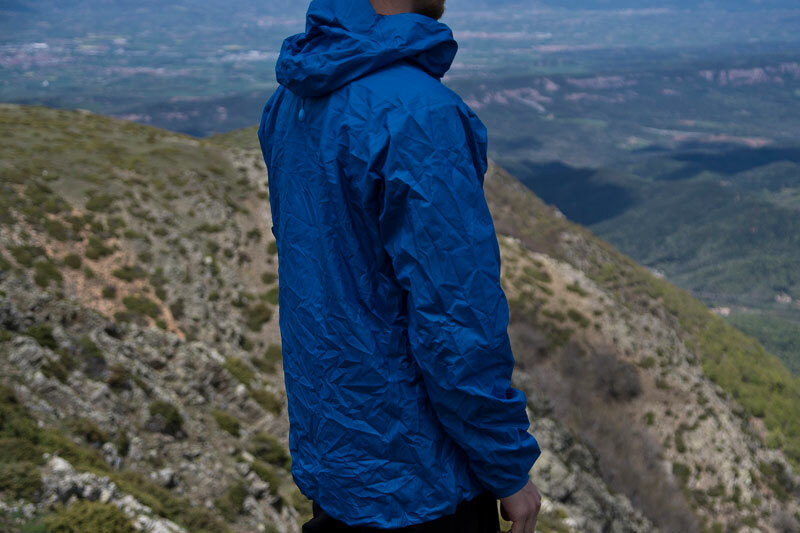 If you are looking for a new hiking jacket, this one performs. There is something exhilarating about wearing the Patagonia M10. It is so light that you can barely feel you have it on. The only reminder is the sound of the rain on the hood. A word about the hood. As I mentioned, it is helmet compatible and can be adjusted with a single draw-cord on the back of the head. Once pulled it will wrap on each side of your head and accompany all you movements. The visor is laminated to be more resistant to winds. Patognia’s fit however as always been a major problem for me. I am a European size S and Patagonia’s American S is simply too big. In the case of the M10, instead of having a slim fit you end up with something between normal and borderline too large. I would strongly recommend you visit your local dealer to buy this jacket as sizing can be a real issue. An XS option would have been great. For all other sizes you might want to check a size smaller. 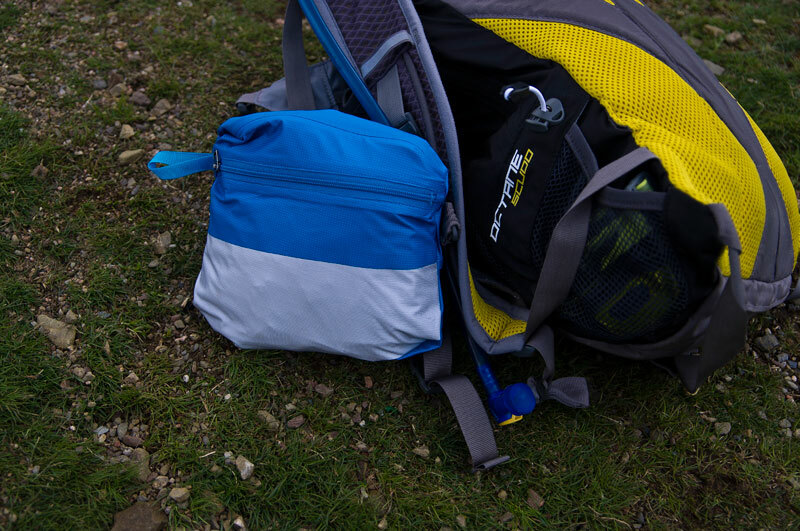 The chest pocket doubles-up as stuff sack which is clever and saves you from having to carry anything more to protect it. There aren’t many jackets on the market with such a low weight. In similar minimalistic fashion you will find the slightly lighter Montane Minimus (215g / 7.6oz in M) , the incredibly light OutDoor Research Helium II (180g / 6oz in L) or the popular Arc’teryx Alpha FL (290 g / 10.2 oz in L) to name a few. There is a good review about the Minimus on Brian Green’s blog. The Patagonia M10 jacket is a damn good jacket. If you can leave without the hand pockets and the price tag, this is a great option. In our testing the M10 performed very well as an emergency rain-shell and it is one of the lightest hard-shell around at the moment. 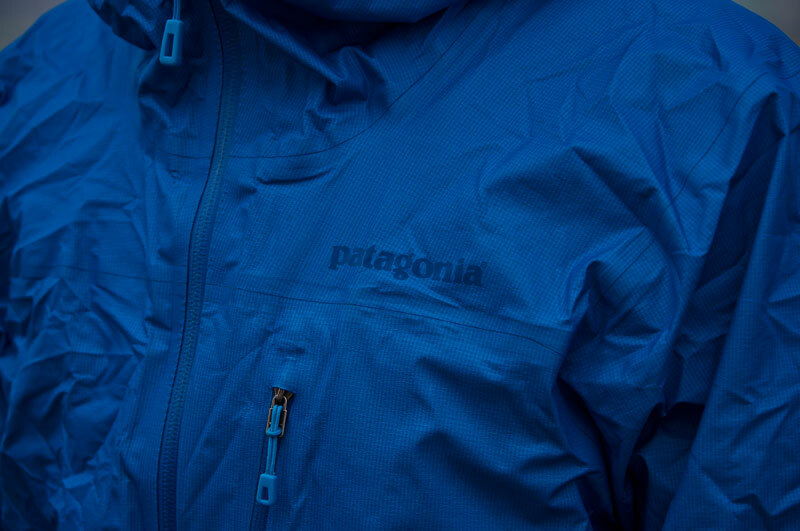 The price could dissuade you at first but keep your eyes peeled, Patagonia usually drop prices significantly during sales.